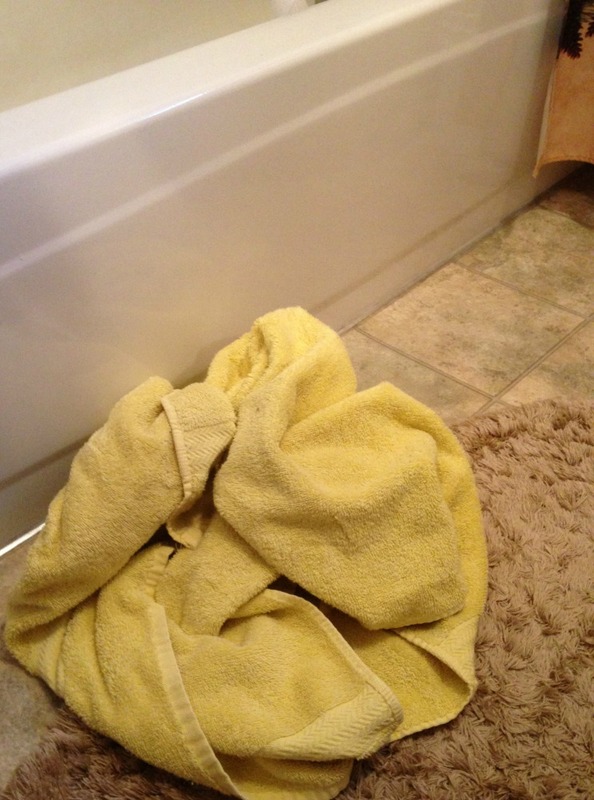 Do your towels ever develop a musty, mildew, yucky odor? Even when they’re washed they still smell bad? Thanks to my small helpers that leave towels, wash cloths, and dish rags wadded up randomly around the house, I’ve got some experience with getting smells out of towels. 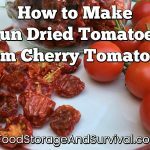 When I first decided to do this, I searched the internet and found solutions like washing in hot water, adding baking soda to the washer, adding vinegar to the washer, and line drying in the sunshine. 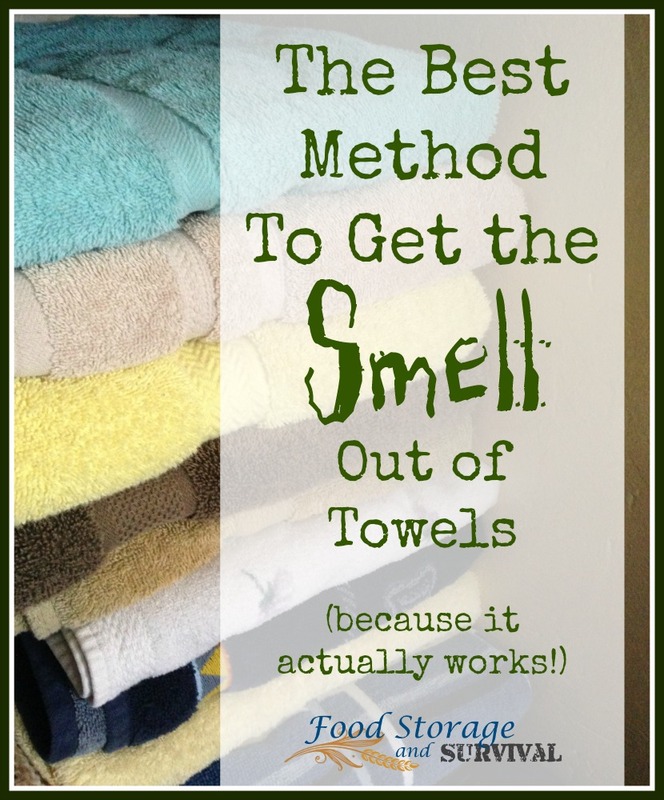 I tried them all, but none of them did the trick for my stinky towels. We were about ready to give up and just trash them all, but we’re too cheap for that, so I went back to my history and water purification knowledge and devised a method that really works. 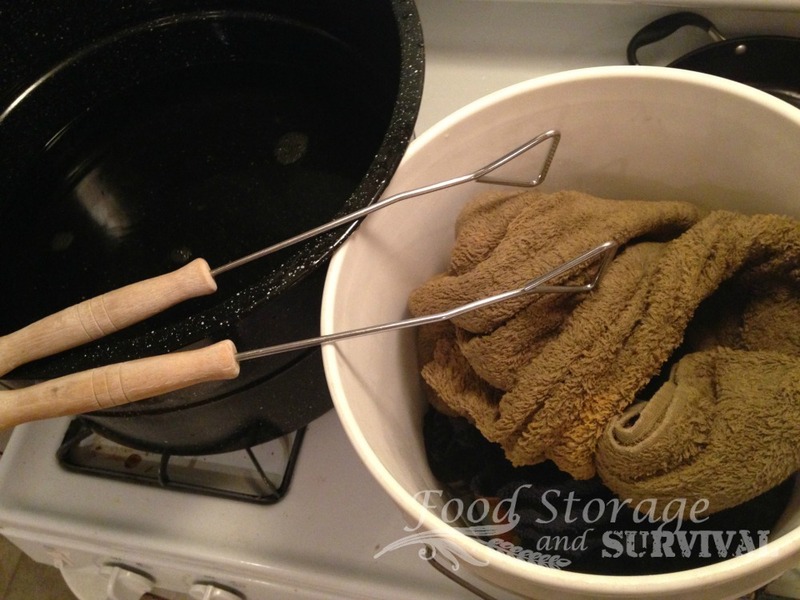 Way back in the old days, clothes were boiled to get them really clean. And we know that heating water will kill bacteria in it, making it safe to drink. But even on it’s hottest setting, my washer doesn’t get hot enough. So today we’re going old-school to get the smell out of towels. First, gather up every offending towel, wash cloth, and dish cloth in the house. We like to just do everything so no stinky towel gets missed. Even the ones that are folded up in the closet. We want to sanitize EVERYTHING (my husband’s pretty sure that once one towel smells, somehow it’s contagious and all the other towels get it, so when we do this we do it for every towel). Then find the biggest pot you have. Mine is a huge 33 quart water bath canner. Fill the pot with as many towels as can be covered with water (I get 3-4 in mine at a time) and add hot water to cover the towels. 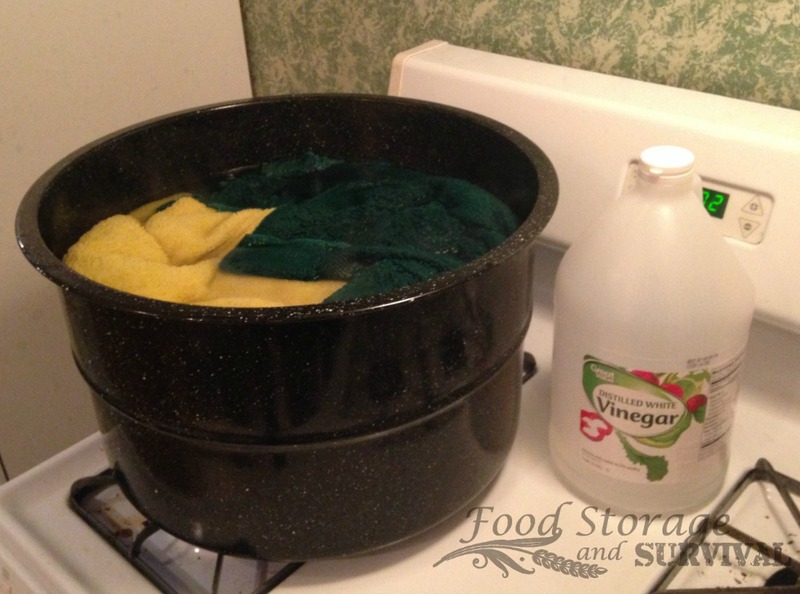 Add white vinegar to the mix for extra de-odorizing power. I do about 4 cups to this big pot. Bring the pot of towels to a boil. I let it boil for a few minutes while I stir the towels around, just to be sure they all got hot enough. 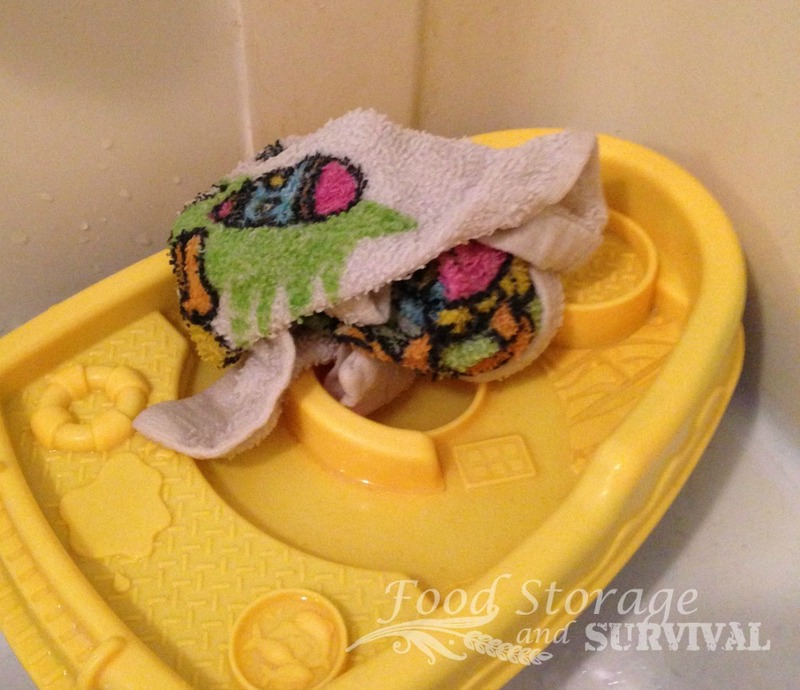 Then fish the towels out and transfer them to your washing machine. Careful, they are hot! A bucket and barbeque tongs makes this pretty simple. You can re-use whatever water is left in the pot for the next batch of towels if you have more. When you have a washer load of towels, add soap and wash and dry like a normal load of laundry. The towels come out odor free! They don’t even smell like vinegar–I promise! YAY! Fresh smelling clean towels! Your husband it correct. Dirty towels infect each other. All my kitchen dishtowels and cloths were gross. In each load of dishes, I would lay a dishcloth down and anchor it with something and wash a load of dishes. It took a long time only washing two in each load. They did catch a few food bits, but they did not stink. I, too, had decided it was the boiling water. I do think the dishwashing liquid helped. I did the boil and wash all at one time in the dishwasher. I salvaged dozens of items this way. I, too, am too stingy to just throw them out. I had considered boiling them. Now, I will. I use the homemade detergent from washing sodas, Borax, and Zote and have NEVER had this problem. I even have a husband that still after 39 years hangs the wet towel after shower on the rack!! UGH!! I also leave the drying/kitchen towels in the laundry room basket for days–weeks–till I get a load and they do not smell. Since I started using my homemade detergent (washing soda, Borax, & Fels Naptha) for the last 4 or 5 years, I haven’t had this problem either. And that’s even with a daughter who “hoards” dirty laundry for a couple weeks in her room — which is where I hunt it down at when all the towels in the house have “mysteriously” disappeared. I really think the Borax & washing soda get the smells out, because we have not had any problems with smelly socks or other items since I’ve been using it!